Sometimes a restaurant opens and you can almost hear the sighs of relief around the neighbourhood followed by a hundred plans clicking into place. "Let's go to that new joint for coffee and eggs." "Why don't we meet at that place on the beach road for a cheeky spritz?" "I can't be bothered cooking – let's just go to Beau for some steak and fish." "We should have dinner with them: what if we head to Beau for a slap-up dinner and an easy roll home?" Beau is part of the redevelopment of the Beaumaris Hotel into swish apartments. The major makeover entailed demolishing all but the facade and returning it – from the outside at least – to a facsimile of the original grand Victorian structure, dazzling white with ornate iron work on the balconies and a Mansard roof that no doubt makes for some rather lovely $2 million penthouses. The Beach Road concourse adjoining the apartments is still being tenanted but Beau and its bottleshop brother Rack and Ruin are already doing keen business. The space is casual and clean with indoor, terrace and pavement tables and high perches with stools; there's a private room in the cellar too. Surfaces are hard so the volume roams between happy buzz and clattery cacophony. A television seems something of a mismatch but will ensure Beau draws locals for big events. The smart, approachable one-page menu appeals for its flexibility as much as its rollicking contemporary flavours. There's an easy facility with European flavours, a bit Frenchy with a skew to the Mediterranean. Just about everything feels the loving touch of Bertha, a charcoal grill and oven. Small dishes include bread with deeply savoury anchovy-laced butter. Bright, pickled shallots bring a little acidic crunch to the salty funk. Smoked trout is a gentler fishy snack, mashed into rillettes, laced with creme fraiche, and scooped on to delicate lavosh. 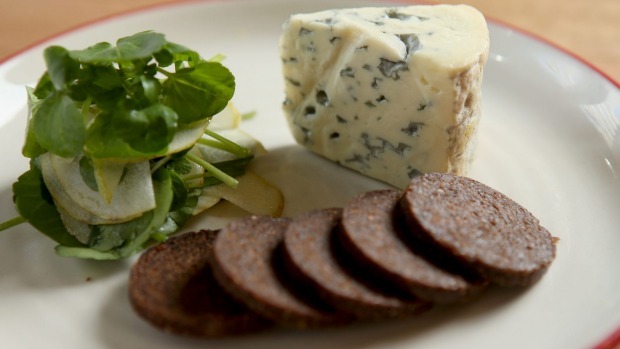 There's a natty section devoted to cheese courses: a wedge of blue, thin slices of pear and discs of pumpernickel are a cracking combination, nicely presented. 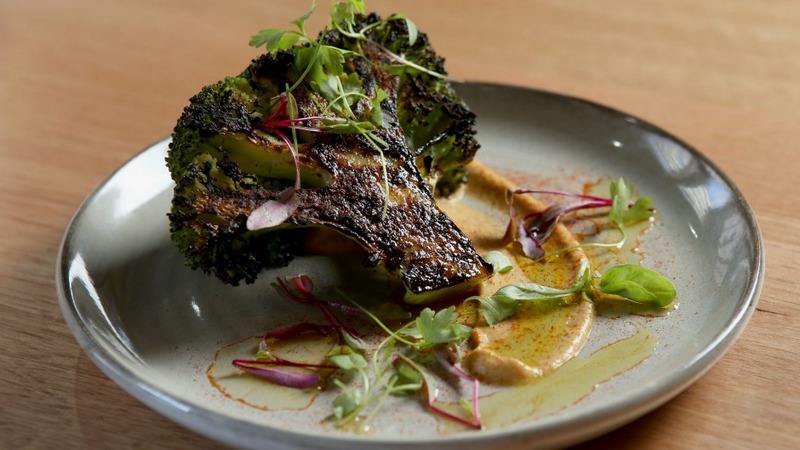 A vegetable dish is one of Beau's best offerings. Broccoli is blanched then charred so it's bright emerald, giving and black fringed. The chunky florets are piled over smooth and smoky eggplant puree and scattered with crisp fried sage leaves. It's downright delicious. Main courses are built for solo dining but easy enough to share and attractive enough to encourage cross-table thievery. Grilled lamb cutlets are piled over carrot-studded cous cous. Strips of melty lamb belly loll among it, juicing up the whole dish with their slippery lusciousness. It's all rather lovely. Snapper is crisp-skinned and moist, the fillet sitting over good potato gnocchi. Beau is a nice den for drinkers; sneak through a jailhouse door to browse boutique bottles at Rack and Ruin and drink them here for $14.50 corkage, or choose from many daily wines by the glass. Service is pretty good, and will likely hum as the venue settles – there are practised hands at the tiller. 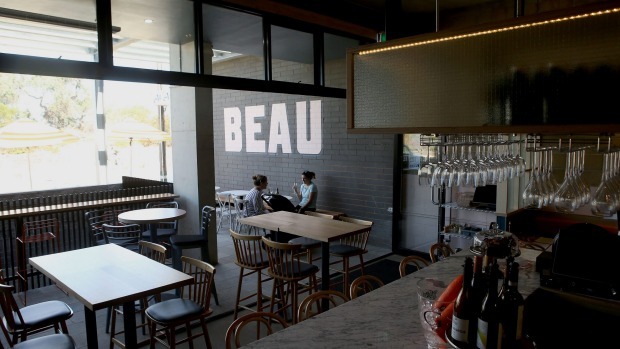 It all adds up to an increase in the neighbourhood happiness index: Beaumaris is lucky to have this Beau in its midst.